Secondary metabolites are chemicals produced by plants for which no role has (yet) been found in growth, photosynthesis, reproduction, or other "primary" functions, i.e. absence of secondary metabolites does not result in immediate death. The apparent lack of primary function in the plant, combined with the observation that many secondary metabolites have specific negative impacts on other organisms such as herbivores and pathogens, leads to the hypothesis that they have evolved because of their protective value. Many secondary metabolites are toxic or repellant to herbivores and microbes and help defend plants producing them. 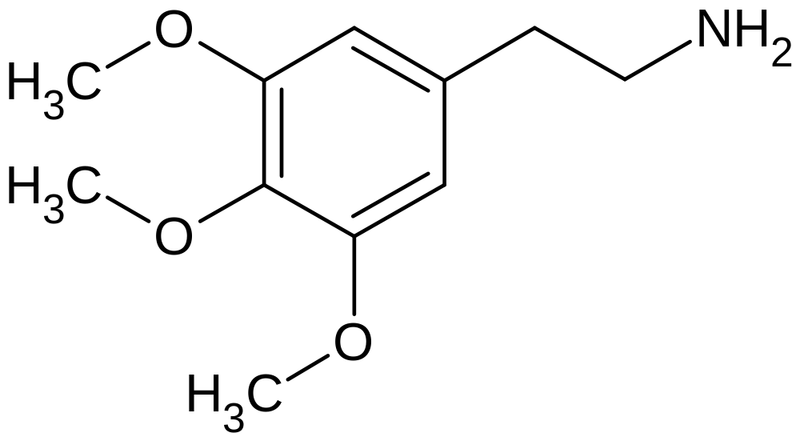 In terms of peyote secondary metabolites are typically alkaloids, the most prominent of which being mescaline. Alkaloids are defined as a class of nitrogenous organic compounds of plant origin that have pronounced physiological actions on humans, a definition that is a rather fuzzy, as the boundary between alkaloids and other nitrogen-containing natural compounds is by no means clear-cut. Mescaline or 3,4,5-trimethoxyphenethylamine is a mind-altering alkaloid of the phenethylamine class, its psychedelic effects being similar to those of LSD and psilocybin. 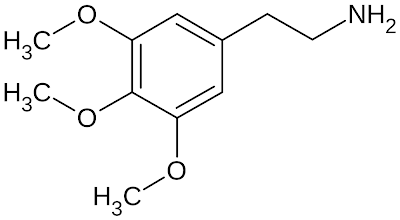 The chemical formula for mescaline is given as (CH3O)3C6H2CH2CH2NH2 or alternatively C11H17NO3. Dr Roman Štarha summarizes a few studies on the alkaloid contents of peyote and other species of Lophophora in an appendix of Rudolf Grym's book Rod/Die Gattung Lophophora. 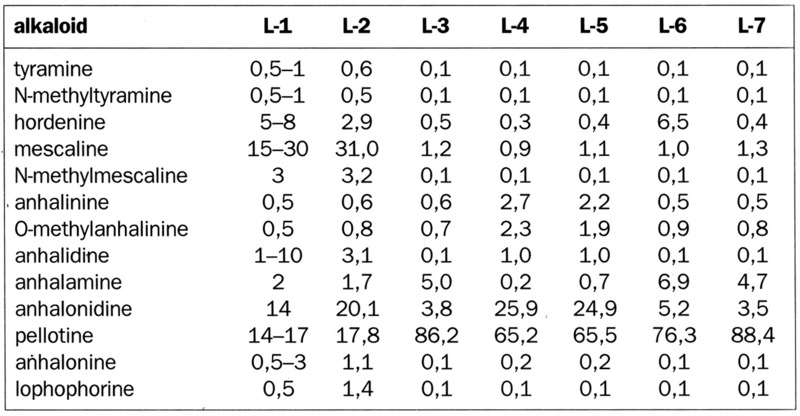 The table below shows the contents of mescaline and pellotine in various peyote varieties compared to Lophophora diffusa and L. fricii. The numbers are given in milligrams (mg) of mescaline/pellotine per gram (g) of living plant (i.e. not dehydrated plant material). According to this study all varieties of peyote contain approximately 0.7 mg of mescaline per gram of living plant, i.e. the mescaline contents of the Lophophora caespitosa, L. jourdaniana, and L. decipiens varieties compare to that of regular peyote (Lophophora williamsii). Similarly the amount of pellotine is relatively low in all these varieties - Lophophora jourdaniana being the exception having more than twice the pellotine contents of the other peyote varieties. You need to apply these results with precaution though, as it varies a lot what plants are understood by and sold under the names of Lophophora decipiens, L. jourdaniana, and L. caespitosa. Both Lophophora diffusa and Lophophora fricii are (as expected) found to be low in mescaline and high in pellotine. Dr Štarha also brings another table that lists selected alkaloids and their percentual amount of the total alkaloid contents of a given plant. E.g. 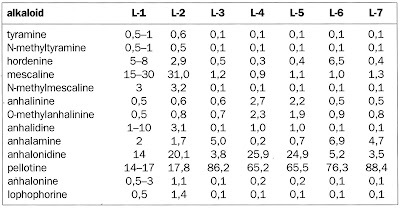 the plant denominated "L-2" in the table below has a mescaline content that constitutes 31% of the total alkaloid contents of the plant. 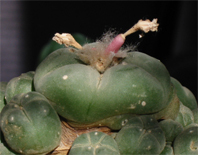 Again the results show that peyote contains a large fraction of mescaline but is low on pellotine; while pellotine constitutes a large fraction of the total alkaloid contents in Lophophora diffusa, L. fricii, and L. koehresii - species that are all low in mescaline. Šnicer et al. based their devision of Lophophora species into the two sections Lophophora and Diffusae on this information: Members of the Lophophora section are characterized by having concentrations of the psychotropic (mind-altering) alkaloid mescaline ranging from 15–30% of the total alkaloid content, while members of the Diffusae section contain a maximum of 1.3% mescaline.